1. It was 8th gathering. If you don't know, Scrum Alliance hosts such events 2 times a year- one in the US during spring, and the other in Europe during fall. 2. 15 people attended in the 1st event 4 years ago. This time we had about 250 attendees. 3. Scrum is rising in popularity and so is the membership to the alliance. It has 27000+ members. 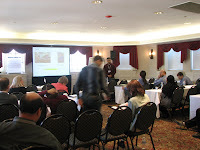 You can get the presentation from either the Scrum Alliance Web site or our company Web site. We also attended two sessions offered by Mike Cohn, the author of two very popular agile books, on effective story writing and estimation. We met many people. The highlights of our attendance were our lunches with Ken Schwaber (co-developed the Scrum process with Jeff Sutherland in the early 1990s) and Mike Cohn. Ken recently started recommending that Scrum of Scrum is unnecessary. He explained why at the conference as an Open Space topic. Some raised eyebrows, some were concerned, while some questioned the recommendations. By the way, we decided to postpone our Beta release of ScrumPad until the end of May. We are trying to decide on a long-term hosting platform for it. We are experimenting with Amazon cloud computing infrastructure. If we do move to AWS EC2, we probably will also introduce a new subscription model. So stay tuned for more on this.